Tis the Season to Play Bingo!!! Join us for a night of fun, laughter and prizes!!! Our 3rd Annual Handbag Bingo continues to draw huge crowds in pursuit of "that hot new handbag". Bring your girlfriends, colleagues, spouses and get ready for some holiday memories. 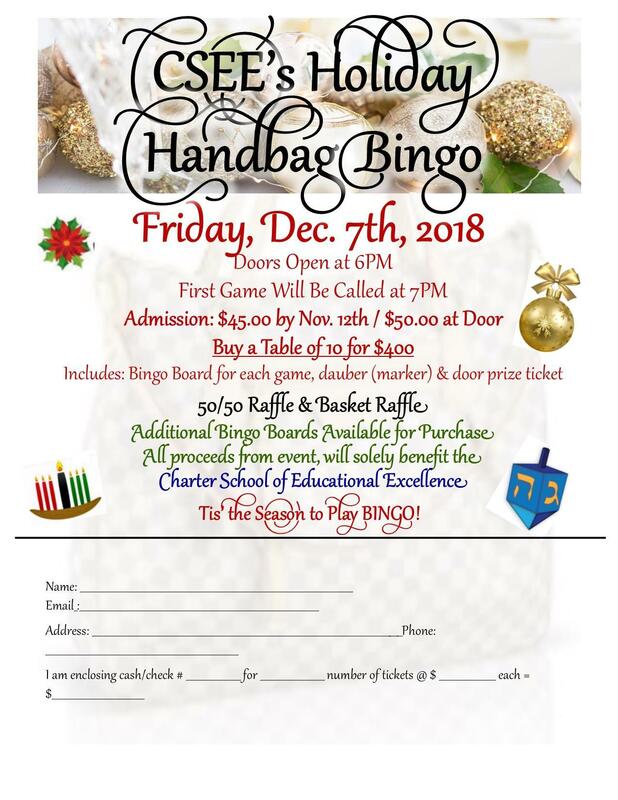 We will have 10 bags to raffle, specialty baskets for ticket sales, door prizes, and of course the famous 50/50 raffle!!! Why do we do this? For our students! All proceeds from event, will solely benefit the Charter School of Educational Excellence. Tickets go fast! SEATS are ONLY guaranteed upon receipt of payment. For information, contact Mrs. Morel at 914-476-5070, Business Office.